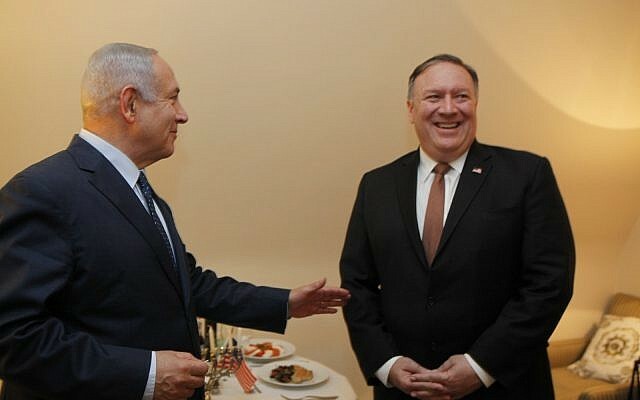 US Secretary of State Mike Pompeo told Prime Minister Benjamin Netanyahu on Monday that the US was committed to “confronting the totality of the Iranian regime’s threats through maximum pressure,” during talks in Brussels on joint efforts to curb Iranian aggression in the region, including by reining in Lebanon’s Hezbollah terror group. As well as reiterating the United States’ “commitment to Israel’s security and absolute right to self-defense,” Pompeo also pledged that the US would continue “fighting anti-Israeli bias at the United Nations,” according to a State Department statement released after the meeting. 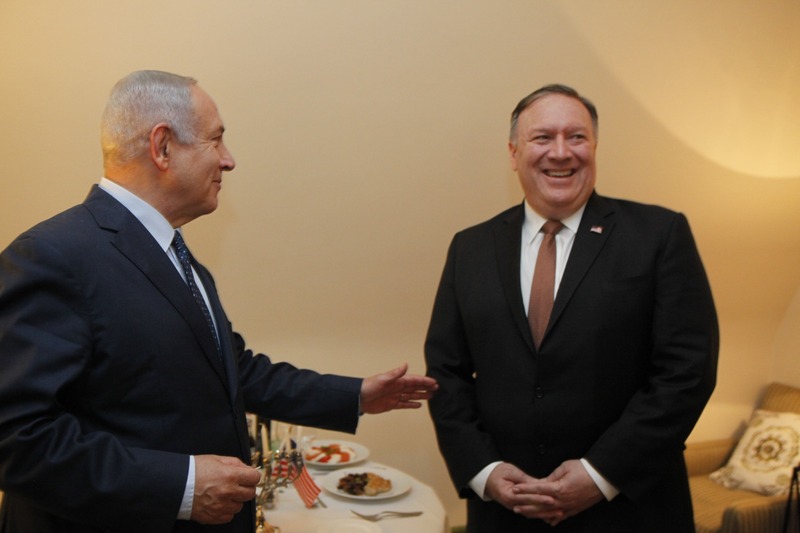 Netanyahu made an unexpected trip to Brussels on Monday afternoon for the meeting with Pompeo, who is in Belgium for talks with NATO counterparts. According to Hadashot news, in a report shortly before the meeting, Netanyahu was planning to tell Pompeo to convey a warning to Beirut that Israel would take action if Lebanon does not work to keep Hezbollah from arming itself. “Secretary Pompeo noted the strength of the US-Israel alliance and our multifaceted cooperation. He reiterated America’s resolve in confronting the totality of the Iranian regime’s threats through maximum pressure,” the State Department statement added. Reports in recent weeks have pointed to Iran shipping arms directly to its proxy terror group in Lebanon, and not via Syria, as had been done until recently. Israel has repeatedly targeted Iranian arms consignments in Syria en route to Hezbollah. On Thursday, a flight from Tehran to Beirut on an ostensibly civilian cargo carrier was widely reported to contain arms meant for Hezbollah. Without specifically mentioning the flight, the army’s Arabic-language spokesperson Lt. Col. Avichay Adraee tweeted Thursday that Lebanon should stop allowing Iranian planes to bring war materiel into the country, along with a black-and-white satellite photograph of Rafik Hariri International Airport. Israel has carried out hundreds of airstrikes in Syria, many of them to keep advanced missiles from being transferred to Hezbollah, which fought a devastating war with Israel in 2006. But it has refrained from carrying out strikes in Lebanon. Though the northern border has seen relative quiet for the past 12 years, tensions have remained high and Israeli officials have recently sounded alarms over Hezbollah’s acquisition of precision missiles that can hit anywhere in Israel. Netanyahu was joined on the trip by Mossad chief Yossi Cohen, National Security Adviser Meir Ben Shabbat, and military secretary Col. Avi Blot. Officials said meeting had been scheduled last week and set for Wednesday, but was moved up to Monday because Pompeo will be flying back from Europe early in order to attend the funeral of former US president George H.W. Bush. The meeting comes at a time of heightened tensions with Iran amid reimposed US sanctions, and after Pompeo accused Tehran of testing missiles that could carry warheads to anywhere in the Middle East and parts of Europe, in violation of a United Nations resolution prohibiting tests of nuclear-capable ballistic missiles. Iran said Sunday that it would continue to develop its missile program after Pompeo’s accusations. Traveling with Pompeo, US special envoy for Iran Brian Hook rejected Iran’s insistence that its missile program is defensive.